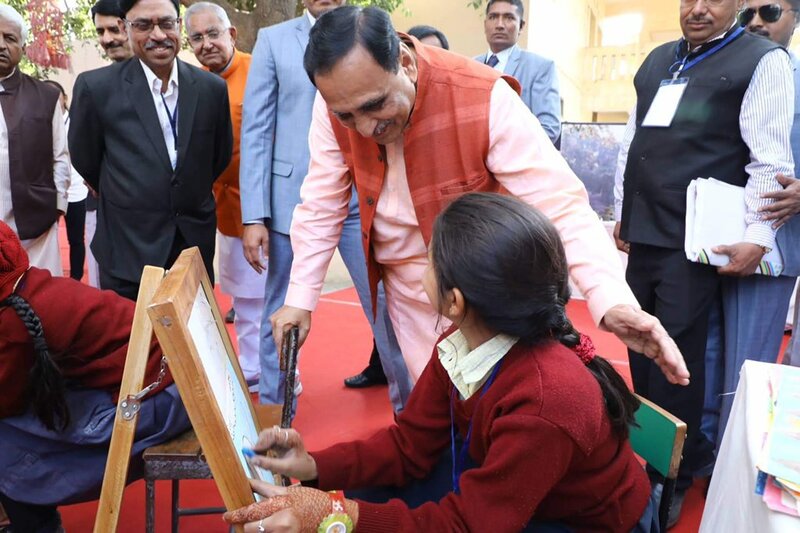 The Chief Minister of Gujarat Shri Vijay Rupani paid a special visit to the Vidyamandir Campus, Palanpur on January 25, 2019 to view various exhibitions put up by the students and others. Shri Rupani was in the city to take part in the official state level celebrations of the 70th Republic Day. There were also other exhibitions put up by the Forest Department, Arms & Ammunition by Border Security Force & Banaskantha Police and gallery of Asmita Uttar Gujaratni displayed within the Vidyamandir campus. The CM also visited Palanpur Museum and gallery which displays the history of the city and the activities of the Trust. Shri Rupani was welcomed by members of Local Non Academic Committee and Sankalan Samiti-1 and also interacted with some of the students. Nearly 16,000 people visited this exhibition between January 22-25, 2019.